Trash bags in response to a report titled: STOLEN by POS from 3 Boys!!! Well I was digging this weekend and came across this bait and was wondering if I should try and fish with it or throw it away......Please help!!!!!!!! These are just a few of the most recent pics.Every week i go back to my property and have the same pics on all my plots and around my camp swimming in my pond also.I've asked my neighbors for yrs to keep them on their property but to no avail.I'm tired of spending thousands of dollars on out of state liscense feeders gas time protein pellets just to have my neighbors dogs and Horses(i have pics of them also)running wild on my property. Need some advice???????? Every gun owner and american needs to watch this video on youtube. Type in psbkzahq Its 30 min long.Let me know what you think? If i could sell every gun i own and knew it would solve the (problem) we have I WOULD and i know most of us sportsman would.My heart goes out to the families of the victims.With that being said if there was a mandatory death sentence with every gun crime PERIOD i really believe things would change.Just my .02 GOD BLESS THE HEROS AND ANGELS OF SANDYHOOK. PS.I thought AR stood for Armalite Rifle not Asult Rifle. Caught this pig in the tank pond earlier this yr.First time i fished it in about 15yrs.It went 5.46 on my scale.It was released in fine shape also. Me and my brother fished a club tourney this Sunday and almost froze to death but the big boys were hitting....#20.73. A comment titled: Trash bags in response to a report titled: STOLEN by POS from 3 Boys!!! Well,Im sorry to hear about your items stolen.I know how ya feel.I had a camera stolen before.I hunt in Ms and have came across quite a few stands and cameras in the forest and the last thing on my mind was to steal the other hunters set up. Don't throw the towel in yet buddy keep the boys in the woods.I have two myself and enjoy every weekend in the woods with them. PS:And for the trashbag that stole or has stolen before if you can read.....F... Y.. Here's the problem!!!!!! They live there and i don't.I've asked for the past 7 yrs to try and contain their dogs and horses but to no avail.That is my hunting property for me and my two 10 and 9 yr old sons and it just kills me every week when we get up there and check our cameras to see the dogs and horses every week eating out our feeders. @#$%^$#@!#.For the people out there that has a few acres that they work their A## off to pay for everyday,and know how much it costs to drive 3Hrs north every Fri know where i'm coming from.I own 2 dogs and just can't bring myself to hurting other dogs but my it's getting OLD>>>>>>>>>>>>>>>>>. I got an idea.Come to Mississippi and pick up all the (cageless) hunting dogs that all the hunters left out.I seen about 4 last weekend and boy do they need a meal bad. Thanks fellow sportsman and land owners.I think what im going to do it when i get back up there on Fri is have a talk with him and try and get a warden there to be the moderator on this situation and tell him im not pressing charges this time but just let him know i totally upset and lets work it out for the LAST TIME.My main consern is that he is shooting down hill towards my pond and my sons are always out there fishing in the pond and that 7mag he's shooting can easily ricochet and kill one of sons and then what. That was exactly my two options before the post.I even think hes a felon also.Might need to do a lil more homework.But yes my insurance is current but Damn i hate to loose a beautiful place over one ***hole,ya know. Must be a liberal cause you turning it around and making it sound like i said give the death sentence to anyone who hurts someone..Take a step back and see where i said anything about pistol whipping anyone sir.I say if you KILL an innocent person you should get capital punishment.Why should you sit in jail for the rest of your life and live debt free rent free etc..... and us taxpayers foot the bill. If you watched the news today in New Orleans,they are finally getting tired of the cab drivers being shot,so now they are proposing a mandatory death sentence for killing a cab driver.HELLO DO YOU HEAR WHAT I'M SAYING.I agree.Eye for an eye. 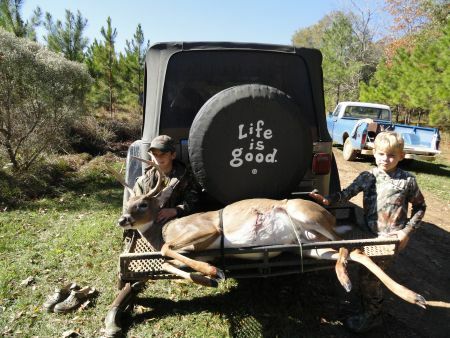 A comment titled: Great Job lil man..... in response to a report titled: 1st Buck !!!! Sounds like a familiar story with my son two yrs ago.Keep em in the woods.Love it. I have all popular deer calibers and have come to favor my 25/06 the most.Its very accurate and a whole lot more forgiving on my shoulder if ya know what i mean.lol.I do reload and use a 115gr nosler BT with RL19 49gr.3.25col.I have killed about 10 deer with it and no problems.Just my .02. I think the reason this issue gets heated is because dog huntin is a rooted tradition just like the mineral rights in Ms.But what people fail to mention is that the cost of land has gone up since 1930 in Ms and people are just asking for more respect for their investment and not wanting their land ruined from dogs or (locations)on their property without permission or justifiable compensation.JUST MY .02. I've been hunting sw miss since 1997 and this yr has been unbelievable with the game wardens checking for corn,especially non-residents.WHATS THE DEAL.The week of Thanksgiving they had 4 wardens check a friend of mine on his own 300acre farm that manages the herd and only shoots mature bucks and limited does as per biologists requests.They showed up at 4:45pm Fri on 4wheelers and ruined all of their hunts and then last weekend in Liberty,another friend had a warden come knock on his box stand and check him and used his glasses to check plot for corn trying to be quiet so he didn't ruin his hunt that he already did and proseeds to tell him that he ran his (Louisiana Plate )and it cam back as a company truck and he owns the company and then left.WTF WTF. I've made the run from Bob's to down river and if you don't know it i would not recomend doing it.3hrs min. Make sure you have the Mineral Rights before you buy gravel because you might be wasting your money because if the OIL FIELD wants to put a location there THEY CAN AND YOU CAN'T STOP THEM if YOU don't own the MINERAL RIGHTS>Just trying to help out a land owner not Mineral Rights owner. A buddy of mine shot what he thought was a doe but turned out to be a 140lb buck that dropped his antlers on Jan 15th.We hunt in Meadville Miss.Called the wardens and they said that was the third call that week,Strange. Love hunting and fishing with my two sons.